In the movie Dead Poets Society, John Keating (played by Robin Williams) stands on his desk to impress upon his students the importance of constantly looking at things in different ways. That’s what we have done at the Colorado School of Mines Alumni Association (CSMAA). We stood on that desk and looked at our world from a different point of view. And what we all saw was opportunity. Fellow alumni, I am excited to share that we are reinventing our model for alumni engagement and outreach. We will join the ranks of the most prestigious institutions with the most connected and engaged alumni by making our network inclusive of all Mines alumni. Recently, the CSMAA Board of Directors voted unanimously to adopt a dues-free membership model for our organization. Thanks to significant support from, and in collaboration with, our partners at the university and the foundation, membership dues will be a thing of the past. Beginning on July 1, 2016, all Mines graduates will automatically be welcomed into the alumni association with access to all member services and enhanced programs and initiatives. Our new model expands our network of alumni members from 6,000 to 26,000, enriching connection possibilities for current students and alumni alike. This exciting change allows us to redirect membership recruitment efforts to focus on our mission of promoting Mines’ rich tradition of excellence by fostering and strengthening connections between alumni and the Mines community. I invite you to celebrate the new opportunities and attend upcoming events, including E-Days ‘Round the World, Mines in Motion, golf tournaments, and more. For event locations and details, visit minesalumni.com/events. 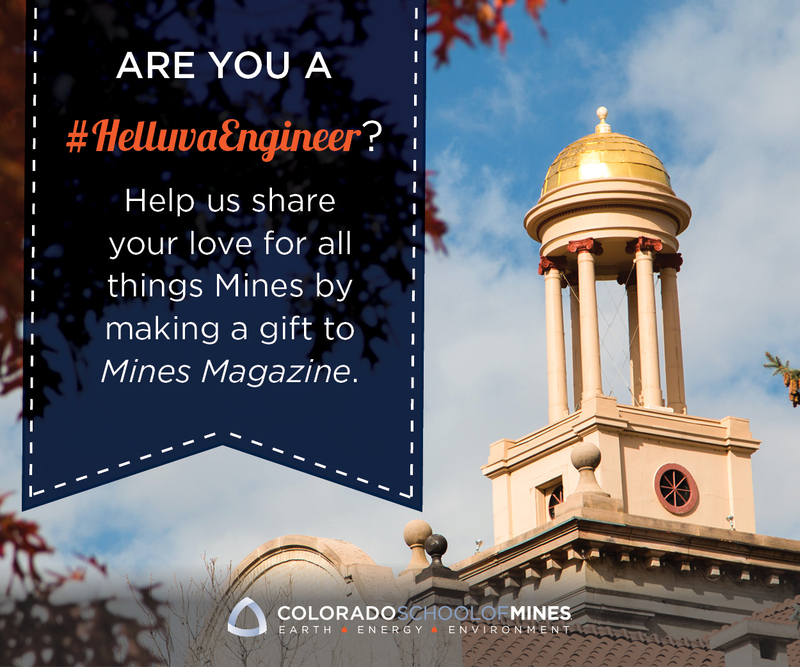 Our Mines pride is strong and so are the long-standing traditions of our alma mater. Your passion and support for this university can make us even stronger. Please stay connected, get involved, and join us as we begin this exciting new chapter. Visit minesalumni.com/membership to learn more about these changes or to share what programs and services you’d like to see from the alumni association in the future.